Identity theft, Hillary Clinton impersonators clad in prison uniforms and a small army churning out social media posts designed to divide. Those are just a few of the strategies deployed by a Russian organization to interfere in the 2016 election, "disparage" Hillary Clinton and support Donald Trump's campaign, according to a federal grand jury indictment announced by special counsel Robert Mueller Friday. The Russian group, the Internet Research Agency, had a monthly budget of $1.2 million to fuel what the indictment called "information warfare." The operation was divided into departments including, a data analysis department, graphic designers, finance department and an information technology flank. The indictment — part of Mueller's ongoing probe into Moscow's election meddling — charged 13 Russian nationals and three entities in the scheme. According to the indictment, here's how they did it. A team of Russians traveled across the U.S. starting in 2014 with a mission — to understand the U.S. political landscape and how it played out on social media. Traveling under false pretenses, the team gathered intelligence that would later inform their misinformation campaign. One Russian traveled to Nevada, California, New Mexico, Texas and New York. In another case, Russians posed as Americans and contacted a grassroots political organization in Texas. The Texans provided some valuable insight: focus on states that could swing either way in the upcoming election. As early as 2016, the Russians stole the Social Security numbers, home addresses and dates of birth of real Americans to open bank accounts. They also used the same information to open online PayPal accounts. Those identities allowed the Russian nationals to maintain bank accounts, particularly several PayPal accounts, and to purchase ads on social media sites. These banks and PayPal accounts were also used to purchase buttons, flags and banners for rallies they would later stage. The Internet Research Agency employed hundreds of people, which they called "specialists," to create fake social media accounts, particularly on Facebook, Twitter and Instagram, that would appear to belong to ordinary American citizens, according to the indictment. Throughout the 2016 campaign, the "specialists" created thematic groups on social media, touching on topics such as immigration, the Black Lives Matter movement and religion to sow discord in the election, the indictment said. The accounts were primarily used to disparage Clinton while supporting Sen. Bernie Sanders, Clinton's opponent in Democratic primary, and Trump. They were also used to push false allegations of voter fraud and boost certain hashtags: #Trump2016, #IWontProtectHillary, #TrumpTrain and #Hillary4Prison. RELATED: Twitter deleted 200,000 Russian troll tweets. Read them here. In one email revealed in the indictment, a specialist was criticized for having "a low number of posts dedicated to criticizing Clinton" and was told to intensify the criticism. During the latter half of 2016, the Russians also made a concerted effort to encourage minority voters not to vote in the 2016 election, or to vote for a third-party candidate. As an example, the indictment cites a specialist-run Instagram account "Woke Blacks," which posted in October 2016 that a "particular hype and hatred for Trump is misleading the people and forcing Blacks to vote for Killary. We cannot resort to the lesser of two devils. Then we'd surely be better off without voting AT ALL." The indictment also revealed that specialists' influence efforts were measured in real time: content was tracked using metrics such as "likes," comments, re-posts and changes in audience size. The Russians' activity was not limited to the digital realm. The "specialists" also pretended to be grassroots American activists and organized several rallies during the campaign. They promoted events on social media using their fake accounts and contacted other groups on social media to promote their rallies. In June of 2016, for example, they used a Twitter account called @March_for_Trump to promote a rally called "March for Trump." The next month, they organized another rally called, "Down with Hillary." Both were in New York. They created a fake persona called "Matt Skiber" to contact real Americans who supported Trump to serve as a recruiter for the march and offered to "give money to print posters and get a megaphone." They also paid Americans to participate in and perform certain rally-related tasks that ranged from sign-holding to cage-building. 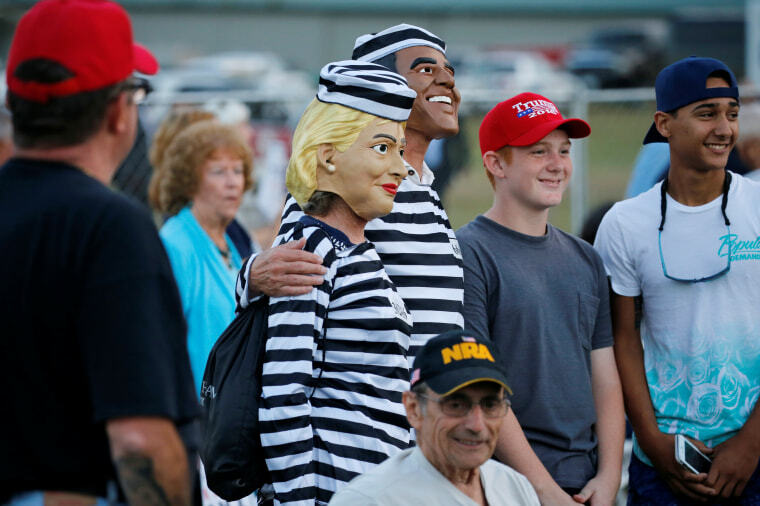 On multiple occasions, the Russians recruited and paid Americans to appear at Trump rallies dressed as Clinton in a prison uniform, according to the indictment. On or about August 18, 2015, they wired money to an American to build a cage on a flatbed truck and paid another American to dress as Clinton in a prison uniform. In September 2016, they used a fake account to reach out to a real American who had previously impersonated Clinton at a West Palm Beach rally. They sent that person money via wire transfer to reprise the role at New York rally they organized. In another case, they recruited an American to hold a sign depicting Clinton and a fake quote attributed to her that read, "I think Sharia Law will be a powerful new direction of Putin." The Russians did have contact with the Trump campaign, though there is no evidence that anyone connected with the Trump campaign mentioned in Friday's indictment had any idea they were dealing with Russians. The "specialists" used their fake accounts to communicate with unwitting members, volunteers and supporters of the Trump campaign involved in local community outreach. The Russian operation also contacted a volunteer for the Trump campaign in New York, who provided them campaign signs for a rally in New York. The Russians purchased more than a dozen political ads on social media and other online sites advocating for Trump and against Clinton between April 2016 and November 2016. To purchase the ads, they established Russian bank accounts and credit cards registered in the same names of the fake Americans used on their social media accounts. They paid for other ads using PayPal accounts. In one case, there was an April 2016 ad stating, "JOIN our #HillaryClintonForPrison2016" and a May 2016 ad stating, "Hillary is Satan, and her crimes and lies have proved how evil she is." To hide their activities and identities, the group bought space on computer servers in the U.S. to set up virtual private networks, which allowed them to spoof their locations on various social media accounts so it seemed like the posts were originating within the U.S. They also created hundreds of email accounts hosted by American-based email providers under fake names.